WELCOME CAMERADOS--THE NAME IS WHITMAN, WALT WHITMAN--WELL, NOT REALLY. I have loved the poetry of Walt Whitman, studied his life so assiduously (I first bicycled to his birthplace in West Hills, Long Island, New York when I was nine years old in 1939) and now so closely resemble him as he appeared in his "Good Grey Poet" period, that I may be excused for so completely identifying with our greatest poet. My real name is Darrel Blaine Ford, although when young I often used the name Velsor Brush (one of Whitman's early noms de plume). I have lived on Long Island all of my 81 years and have been a teacher and the director of a youth organization. I grew up in close proximity to Whitman "country" (i.e. Huntington and Babylon Townships from the Long Island Sound to the Great South Bay) and one of my teachers was a collateral descendant of Walt. Unlike old Walt, I am a proud father of five and a grandfather. A regular feature will be the Whitman quote of the month. The work of fishermen, the work of the eel-fisher and clam-fisher. desperate with their claws as I take them out. I too leave little wrecks upon you, you fish-shaped island." ARE YOU FAMILIAR WITH--"Starting From Paumanok" or "Song of Myself" or "I Sing the Body Electric" or "Song of the Open Road" or "Out of the Cradle Endlessly Rocking" or "When Lilacs Last At the Dooryard Bloomed"? If not, you have a wonderful experience just ahead of you. Borrow or buy a copy of "Leaves of Grass" and begin a joyous, liberating and mind expanding opportunity, now. If, however, those titles are familiar, then we share the enjoyment and wonder that reading Whitman's lifelong work, through nine editions (1855 to 1892) never fails to provide. Walt Whitman deserves to be more widely read and appreciated, particularly by the masses of people to whom he addressed his chants. He should be understood to have emerged from the common people and to have succeeded in creating a new, vibrant literature for America, without much formal education or encouragement. He is one of the most courageous figures in our history, because he persisted in the face of every kind of discouragement in sounding his "barbaric yawp" over the rooftops of the world. 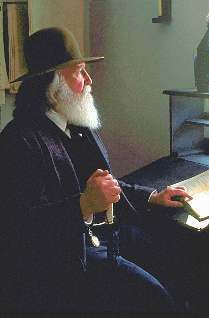 My way of celebrating and introducing Walt Whitman is to impersonate him, wearing the dented brown slouch hat and careless 19th century garb that he affected. With my wild, white mane of a beard I tell his story in the first person and read his poetry as he did to school children, to library and club groups and to college audiences. 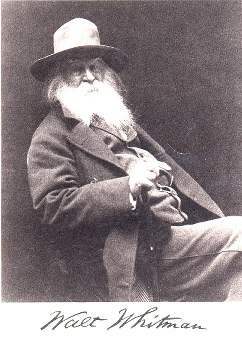 Whitman said, "If you seek me, look for me under your bootsoles." I am not nearly so remote. You can reach me by e-mail at: waltwhitmanofli@aol.com or phone me at: (631) 661-7040. 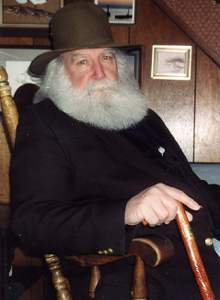 E-mail or call me if you would like Walt Whitman to come to your school, college, club or library. There are many online schools with poetry courses where you�ll formally study Whitman. You can read �Leaves of Grass� by yourself but experiencing the poems with classmates and a teacher is a fantastic learning opportunity as well. 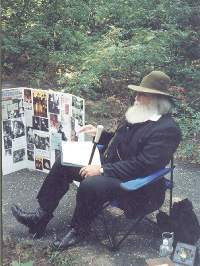 Looking for other living history characters?